A recent investigation of three fields east of Irchester in Northamptonshire has uncovered tantalising glimpses of a lost medieval iron smelting industry in the village. The work was undertaken by ULAS for the landowner in order to assess the likely impact of a proposed housing development on any underlying archaeology. Of the twenty-five trenches excavated, archaeology was found in five trenches close to the village along Station Road. The rest predominately revealed naturally occurring limestone brash beneath a thin layer of topsoil. Looking west across the fields towards Irchester, with one of the excavated trenches in the foreground. The archaeology was typically medieval in character, comprising pits, post-holes, ditches and the stone footings of a building. In some trenches the evidence was ambiguous. 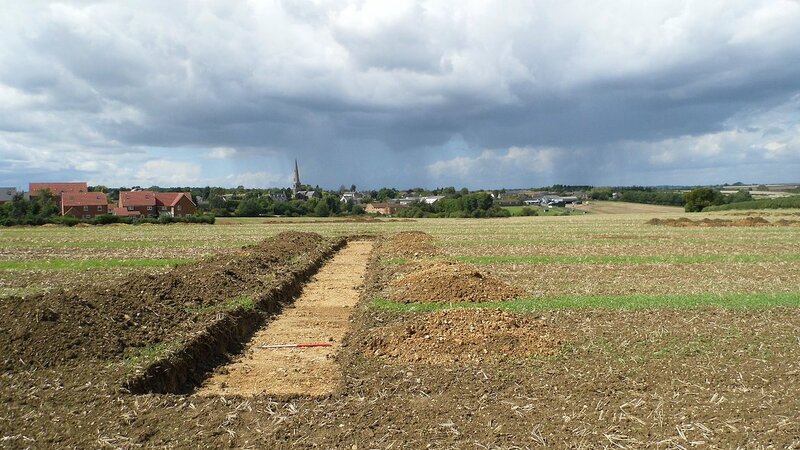 Seven possible post-holes in a trench close to the village may be evidence of activity dating to the 12th or 13th century, possibly timber buildings or fence-lines. However, a tithe map of the village dated 1845 shows that this area was formerly woodland and it is possible that, rather than being post-holes, these features are the remains of root boles from trees or other vegetation. Better evidence of archaeological activity in this trench was a ditch running parallel with Station Road, perhaps an old field or property boundary, and ditches recorded in two other trenches probably also represent medieval field boundaries. Investigation of one trench close to Station Road found considerable evidence of medieval activity in the vicinity – a building, possible trackway or yard surface and associated pits and ditches. The building was probably of timber construction resting on a shallow stone plinth and a doorway on its eastern side suggests it faced downslope towards a stream running across the project area. 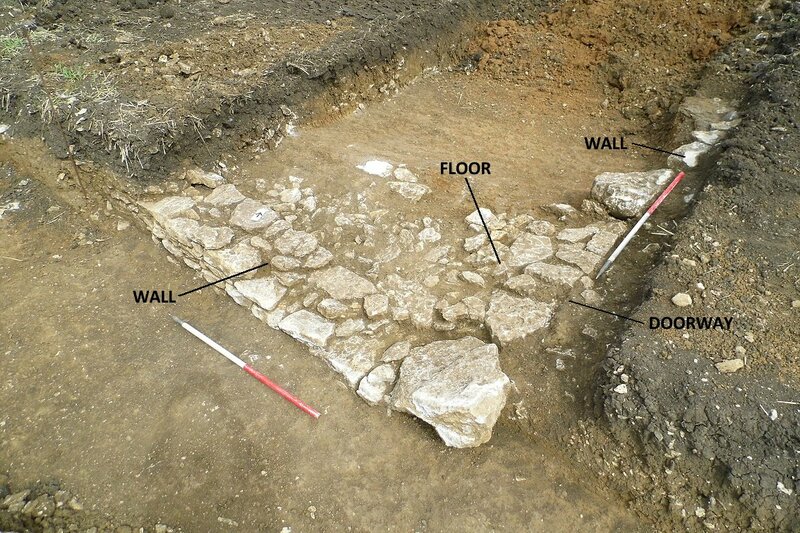 Archaeologists record a medieval building in one of the trenches. The south-west corner of a medieval building. Parts of the wall, floor and a doorway still survived. Overall, a few sherds of St Neots ware and Stamford ware hint at a Late Saxon or Saxo-Norman presence in the area (10th to 12th century) but the pottery assemblage as a whole suggests that much of the activity across the site is broadly contemporary, dating to the early 14th century. Large quantities of tap-slag, furnace lining and unprocessed iron ore was recovered from a number of adjacent features, suggestive of iron smelting occurring in the vicinity. Iron ore deposits surround Irchester, rising to within 3m of the ground surface, and iron rich deposits of ironstone have been noted in the field adjacent to the newly discovered medieval building. Iron production in the region can be attested as far back as the Iron Age and major Roman smelting sites have been excavated nearby at Kettering and Higham Ferrers. However, few medieval production sites are known. Typically, manufacturing centres need access to large quantities of fuel (charcoal) and iron ore in proximity to each other, as well as water for power-driven forges. This site on the edge of Irchester, close to a stream, iron deposits and the Northamptonshire charcoal industry potential affords all three for a small-scale iron production industry in the village. 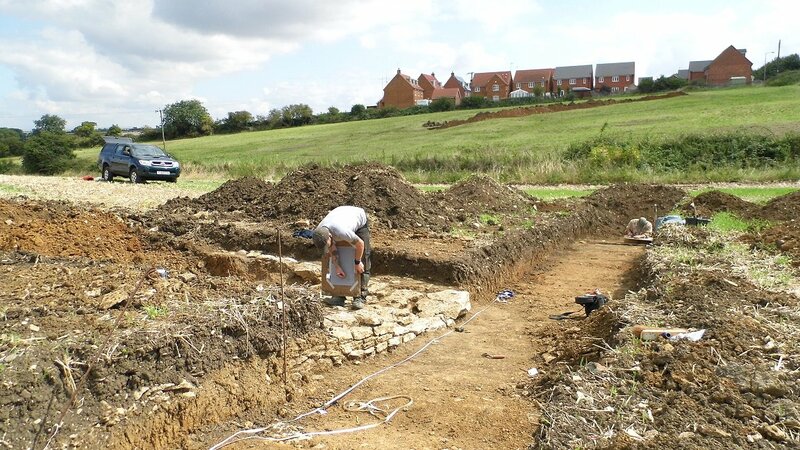 Although this site has yet to be explored in any detail and no furnaces have so far been found, it is hoped that future work will provide valuable new insights into this poorly understood aspect of medieval Northamptonshire.